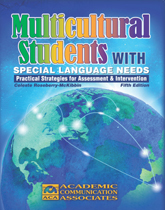 This comprehensive volume describes practical strategies for teaching students with autism. 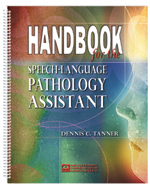 This book is designed to provide paraprofessionals with information as speech-language pathology assistants. 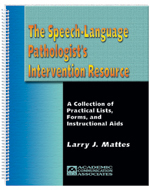 Speech Disorders Resource Guide for Preschool Children - Special Offer! 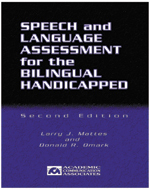 This book provides detailed information about assessment, analysis, intervention outcomes, and treatment efficacy methods. 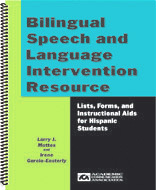 Here is a comprehensive collection of lists, forms, and resources that you will use on a daily basis when working with children or adults with communication disorders. 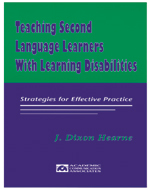 Here is a comprehensive, easy-to-use resource that will help you meet the needs of second language learners with language disorders, reading disabilities, and other problems that affect learning. 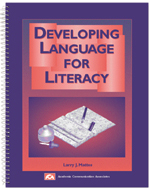 This practical resource includes information relating to all phases of assessment and intervention. Very helpful! Here is a book that will help you write measurable IEP objectives quickly and easily in a format that will be easy for parents to understand.